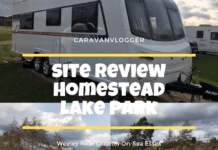 Home Caravan Blog Caravan Towing Cover – Do I Need One? 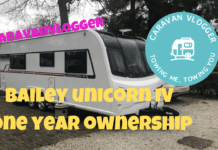 Isn't buying a jacket for your caravanning like buying one for your dog? Don't be silly, of course it isn't, a dog doesn't need a jacket, it has a fur coat. 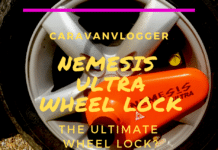 So does a caravan REALLY need a jacket? 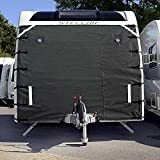 Should I buy a caravan towing cover? 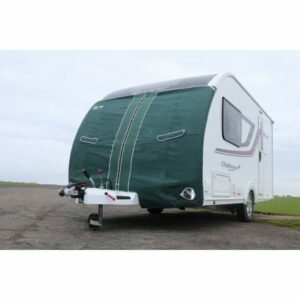 You know the sort of thing, it covers the front of your caravan and protects it whilst towing. They’re not meant to be left on when in storage, just when driving. The price ranges from around 200 quid for a universal fit covers to about 400 for a tailor fitted on. Now, I just can’t get my head around them. 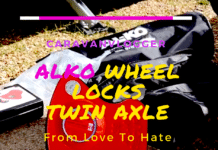 I’ve been towing since 2006 and never sustained any damaged to the front of the caravan whilst driving. I have the side when driving down a narrow road and a bush, or tree managed to somehow get under a side window and create a dirty great crack in it. Now, a towing cover wouldn’t have helped me there! Of course, I only like the expensive ones, I personally think they look much better as they seem to fit better. They also have flaps where you can access the front lockers and also a flap where you can expose the windows, so when you stop you can see out. You see the problem is, I don’t want to spend 400 quid, and I’d rather not have the universal fitted one. Now, my dilemma is further exacerbated by a conversation I remember having with a friend who was a policeman. I was considering getting a house alarm at the time and spoke to him about it. Again, I didn’t really want to spend the money. “Do you know the first thing that people do after we attend a house burglary ?” I resisted suggesting I was surprised they attended any burglary. “No”, I replied, actually having a good idea what they did. Hmm. You see now I’m thinking, if a brick flies up and smashes straight into my window, the second thing I’d do is buy a caravan tow cover. What’s the first? Spend money getting it fixed – probably more than 400 quid. Oh, I seem to have answered my own question. I had to get a small side window replaced on our Sterling Eccles and that was over £400. OK, so dislike is a bit strong. The thing is, they get really good reviews. I just don’t like the look of them. I know it shouldn’t matter, but it does. Anyone have 400 quid I can borrow? 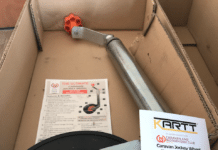 Did the ever indecisive Caravan Vlogger ever actually put his hand in his pocket and purchase a tow cover.. Well, you need look no further than here…..All will be revealed, well, actually covered?